The Echo Grande pendant has clean lines and a simple yet elegant look perfect for your home or business space. 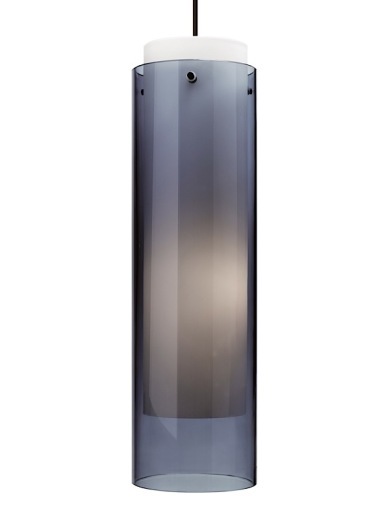 With a transparent glass cylinder shade over a white glass cylinder, this pendant creates a unique lightling look which could go well with modern to traditional decor. Black, satin nickel, and white finish options highlighted with three satin nickel cylinder details and clear cable; antique bronze finish highlighted with three antique bronze cylinder details and brown cable. Select between an incandescent or fluoresecent lamping: 120V, 75W medium base A19 lamp or 32W GX24Q-3 base triple tube compact fluorescent lamp (electronic ballast included). Bulbs included. May also be lamped with GX24Q-3 base 26 watt triple tube compact fluorescent lamp (not included). Fixture is provided with six feet of field-cuttable cable. Incandescent version dimmable with standard incandescent dimmer (not included).